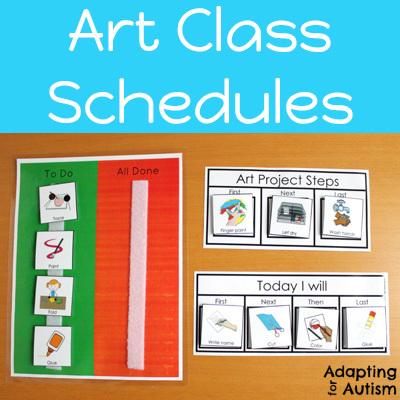 Art projects can be especially challenging for students with autism. The sensory experience and fine motor requirements can lead to anxiety and frustration. So I know better than to just put a pile of supplies in front of my students and expect anything but a mess at the end. But there’s good news! Setting expectations and providing communication supports can help you reduce some of the challenges. With that in mind, I created a resource with many of my favorite art visuals. 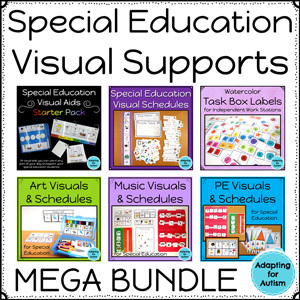 These are perfect for art projects within a special education classroom or during an actual art class. After deciding what our project will be, I made schedules. We were nearly 1:1 in art so I was able to write out the instructions for the paras and include a visual for the students (almost all of whom could not read). These schedules can be super detailed but also take a bit of time to put together. You have to decide if whether taking that time during prep makes sense for your staff and students to be able to complete the project without a single bit of guidance from you during the class. I could have also used First/Then boards as my students were used to those for other activities throughout their day. These are less detailed but still effective. You can use generic instructions that work for many projects – First Paint / Next Let Dry / Last Wash Hands. Giving these simple schedule prompts can reduce anxiety about what and how many steps the student will complete. One great thing about your schedule icons is they can serve double duty as choice boards. While I dictated the project, students should be making as many choices as possible. And they should be communicating those choices! 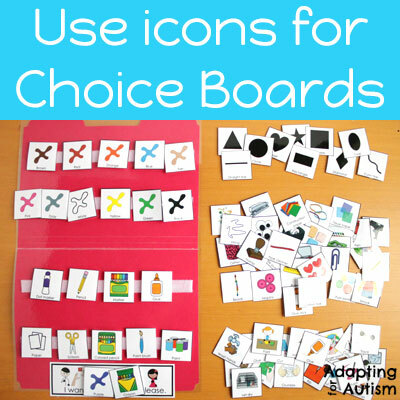 Choice boards are a great way to create these communication opportunities because an open ended “What do you want?” is about as effective as speaking another language. I like to contain icons as much as possible so I laminate a file folder and place Velcro strips inside. I can easily offer choices for colors, materials, shapes, and actions. 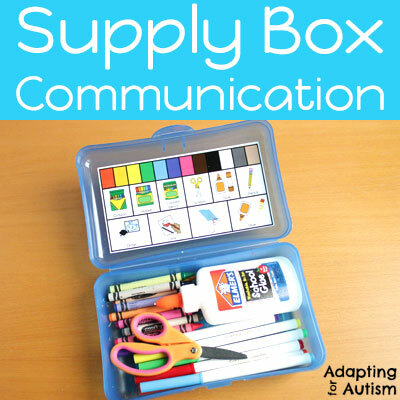 I set up the supply boxes before each class with only the supplies we needed for that project. 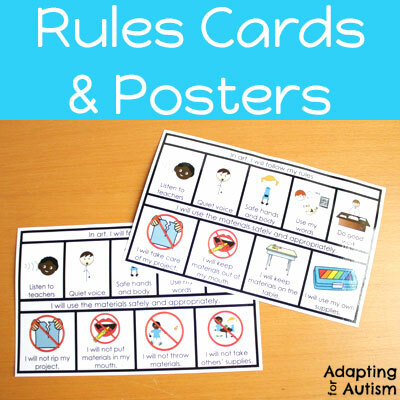 Many of my students used AAC but they didn’t always have the words we needed so I made mini communication boards for the inside. I only included the basics – colors, materials and actions. 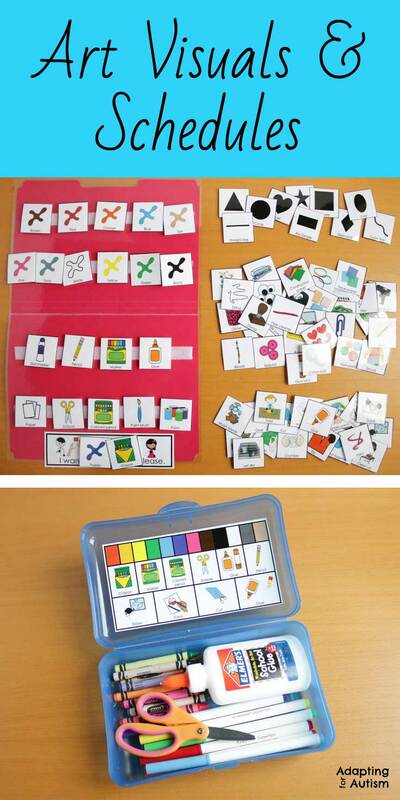 These are also great for verbal students who still need some visual supports. 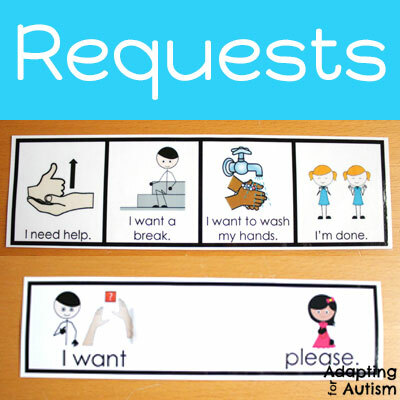 These simple cards are used for students to make requests. They cover the basic needs that often come up in an art class. Art projects often led to me making up rules I never thought I’d need. We don’t drink the glue. Stop sucking the paint out of the dot markers. Sooooo, we make art specific rules visuals! I know best practice is to write the rules in the positive – write what you want the student to do. I decided to make two sets. For my literal friends, one set says “don’t.” For your not-so-destructive group, you can use the positively written rules. I like the keep mini cards of the requests mentioned above and these rules right on student desks when possible. They can be referred to by staff or students easily. 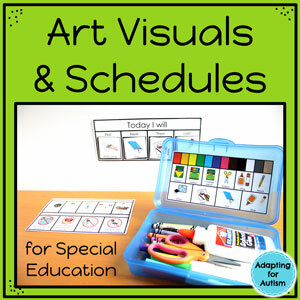 Find all of these visuals and a few more in my Art Visuals and Schedules resource in Autism Work Tasks store.